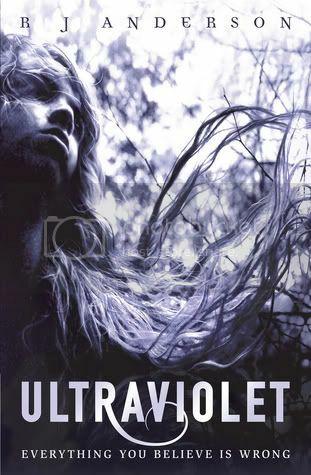 Ultraviolet is my very first read by R.J. Anderson, and it definitely won’t be the last! I enjoyed reading this book; it’s really different than anything I’ve read, given the subject matter. The main character, Alison, was a really strong, likeable girl. Even in the situation she was in, confused and scared in the beginning, she grew more confident in herself every day. She knew she was different than others, but she was afraid of letting people know just how different she really was. But she didn’t give up, and she believed in herself. I really liked Faraday as well. I thought I had him figured out, but I was definitely wrong! Most of the secondary characters have a story as to why they are in the institution, and even those characters grew on me as well. The book drew me in from page one. The writing held my attention and was fast paced. The plot was believable and really interesting, and the twists and turns kept me in suspense for what would happen next. The ending does have a bit of a twist, and while I knew ‘something’ different was coming at the end, that ending definitely wasn’t it. Also, the ending was pretty much left wide open, so I’m hoping that means this could possibly be a series? Overall, this was a really different and interesting read for me. The summary doesn’t quite let you know what you’re in for when you do read the book. I really did like this book. Thank you to Netgalley and Lerner Publishing Group for allowing me to read and review this book! I just got accepted for the via NetGalley and am crazy excited about it. It sounds completely fascinating and, if your review is any indicator, I will love it! I have this book to read as well, from NetGalley... I'll have to move it further up my list! This sounds so unique and different. I am really wanting to read this now. I love books with twists that you can't see coming. Great review! This was a great teasing review! (you know, the one's where you want to read the book RIGHT NOW) I have to read this book in the near future. It's a matter of life and death. Thanks for the great review! I was curious about this one and now I know I'll have to read it. It just sounds so unique! I want to read this so bad!!! YAY!! I wonder if it's still on NetGalley? This is one of my next reads! Thanks for the great review! I just downloaded this to my Kindle. Good to know you enjoyed it! I loved this one too! It was just so interesting and, combined with the fast pace, I couldn't turn the pages fast enough. SO, SO GOOD. I can't wait to read this! I've heard lots of good things and the synopsis is so intriguing! I'm glad you enjoyed it, it sounds like a great read. This is a book where I've seen the cover a lot but haven't really heard much about it. Seems like a great mystery/suspense! And, I just love books with great secondary characters. I've read her HP stories before and so I've been following her for some time now, although this will be the first original work that I've read. I'm really looking forward to it as I've always loved her writing. I was really interested in this book up until it veered off path. I was kinda bummed that it went down that path, however, I thought it was super interesting. I enjoyed learning about Allison right along with her. From the blurb I really have no idea what to expect from this book but I have heard some great things about it so I know that I will be reading it soon!